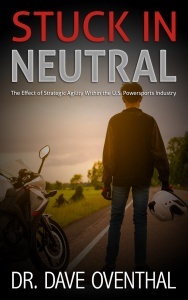 The purpose of this quantitative, non-experimental research was to analyze the impact of strategic agility on organizational performance within United States (U.S.) powersports retail dealerships. The study was important due to lack of quantitative research based on Doz and Kosonen’s strategic agility construct, previous research focused primarily on technology and manufacturing firms, and no previous research on strategic agility within the U.S. powersports industry. The following research question was analyzed; To what extent can United States (U.S.) powersports industry retail dealerships increase organizational performance through strategic agility (strategic sensitivity, collective commitment, and resource fluidity)? This dissertation was based on the theoretical study of Doz and Kosonen (2008). The research was conducted through an online web-based survey. A population of 3,000 U.S. powersport dealership owners and managers resulted in thirty completed surveys (n = 30). The independent variable strategic agility, composed of three meta-capabilities (strategic sensitivity, collective commitment, and resource fluidity) was analyzed against the dependent variable organizational performance using Pearson product-moment correlations and multiple linear regressions. The data from this research study indicated no relationship between each individual meta-capability and organizational performance. However, the three meta-capabilities, in combination were significant predictors of organizational performance. The results of this study supported the strategic agility construct of Doz and Kosonen (2008) and previous studies by Oyedijo (2012) and Ofoegbu and Akanbi (2012). Recommendations for future research include qualitative or mixed-method studies to better understand how strategic agility relates to organizational performance. Dealership managers can benefit from this study through the application of strategic agility within dealership operations to potentially improve organizational performance.